The Sparkly Pumpkin Bubble Bar is a product that never fails to make an appearance in Lush’s Halloween product line up. Year in, year out it comes back, ready and waiting to take on yet another Lush autumn. 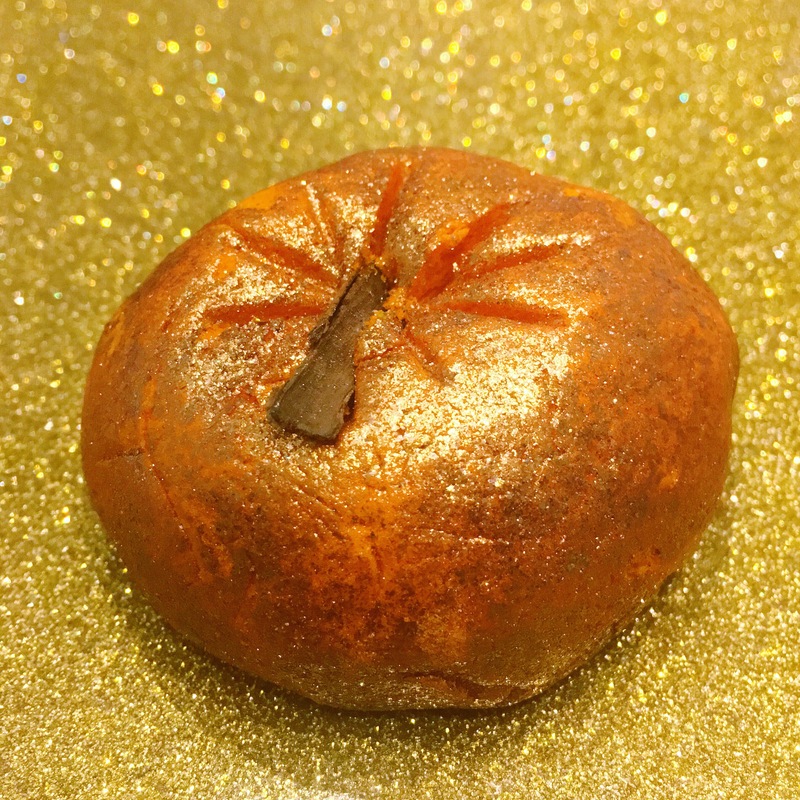 As its name suggests the Sparkly Pumpkin is a bright orange, pumpkin shaped bubble bar that has a generous coating of golden lustre with a single piece of cinnamon stick as its stalk. 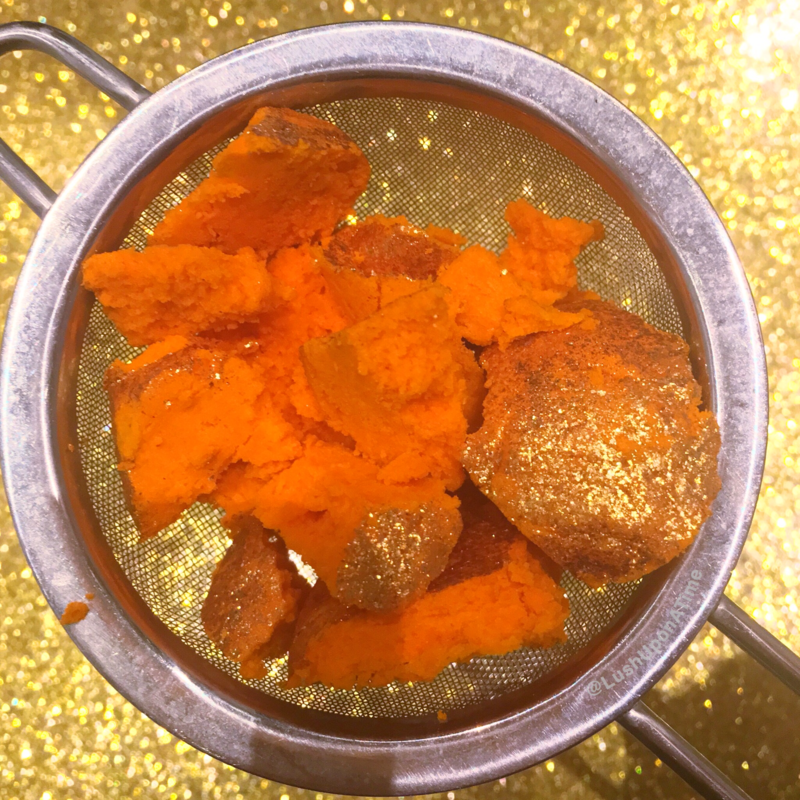 I think the first time I ever used Sparkly Pumpkin was back in 2015, it wasn’t a product that instantly stood out to me, visually I didn’t and still don’t find it the most eye catching of Lush products. Back then the only reason I originally gave it a chance was because it came in a gift set that my husband bought me. 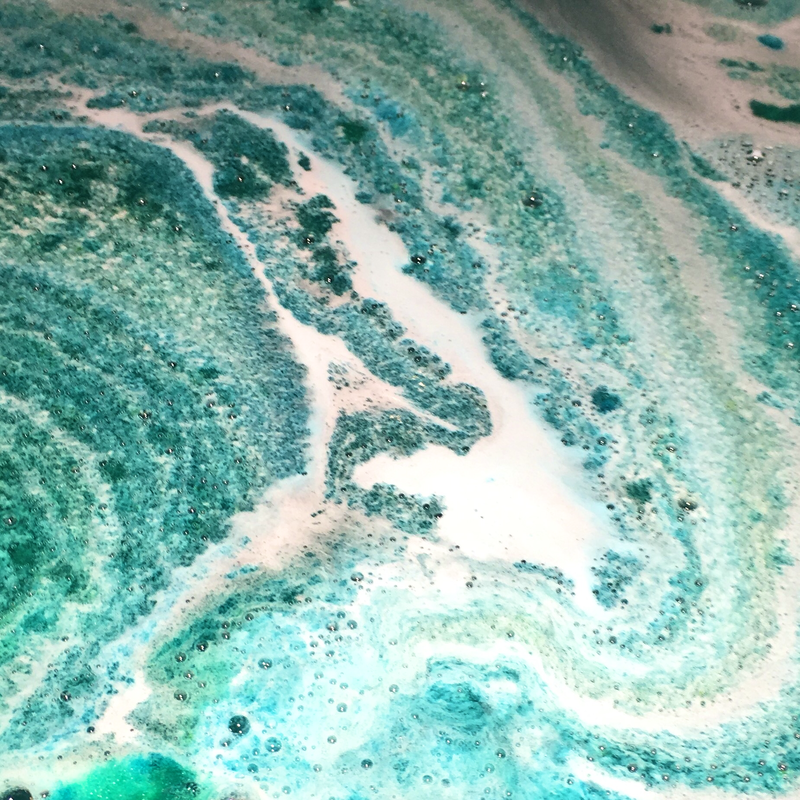 Although the bubble bar doesn’t wow me as much as other Lush products do, I can still see that it has some amazing qualities and can also identify the reasons why it comes back to stores every autumn. The Sparkly Pumpkin bubble bar is relatively small, it fits snuggly in my ‘child-sized’ hand. I can see why some people are tempted to use the whole bubble bar for just one bath, I however use the one Sparkly Pumpkin over 2 baths without any compromise on quality or how many bubbles it creates. Sparkly Pumpkin bubbles up very quickly, I recommend using it in a sieve as I find it is quite a crumbly bubble bar, many people don’t use a sieve for it though, some simply just crumble it in their hands under a running tap. I have tried both ways and because it is quite a soft product I’ve had the best results from the sieve, I find letting it just crumble doesn’t get the most out of it bubble wise, you tend to waste quite a bit, finding pieces of it at the bottom of your tub once you get in. In regards to Sparkly Pumpkins scent, I expected it to be jam packed with all things pumpkin, it however isn’t. Strangely, the Sparkly Pumpkin bubble bar actually contains juniper berry, lime and grapefruit oils. This unique blend of essential oils makes the Sparkly Pumpkins scent a woody and gentle citrus blend, I find a soak in a Sparkly Pumpkin bath leaves me feeling both soothed and uplifted. If you favour the products with a more subtle scent then Sparkly Pumpkin would be a great one for you. I know some people want to run a mile when they see a shimmery Lush product but being honest as always, the sparkling products really aren’t that troublesome. I get a little tired of explaining this in all of my sparkly product reviews but as someone who once too feared anything glittery, I can’t help but mention it. I have been converted and now love a sparkly Lush product. The shimmer just rinses away, I always describe it as cosmetic shimmer, kind of like what you get in make-up such as some bronzers and highlighters. A Sparkly Pumpkin bubble bath leaves your skin silky-smooth and well nourished. Its scent unfortunately doesn’t hang around on your skin for very long but it does last throughout the bath. Sparkly Pumpkin isn’t one of my favourite bubble bars purely because I find it a little boring, I do however like to pair it with a bath bomb. Last year my favourite Lush cocktail that contained Sparkly Pumpkin was it, mixed with the Pumpkin bath bomb. This year the Christmas Sweater bath bomb was however introduced to the winter line and that works with Sparkly Pumpkin perfectly too. The Marmalade Jelly Bomb is the last of the 4 recently released jelly bombs that I have yet to review. At first I really wasn’t sold on the idea behind the jelly bomb however after trying and enjoying The Big Sleep, Green Coconut and Dark Arts jelly bombs I was eager to try out Marmalade. When the information on these 4 jelly bombs leaked online, I admit that out of the 4 of them I was most excited to try Marmalade as I am a sucker for anything citrus. 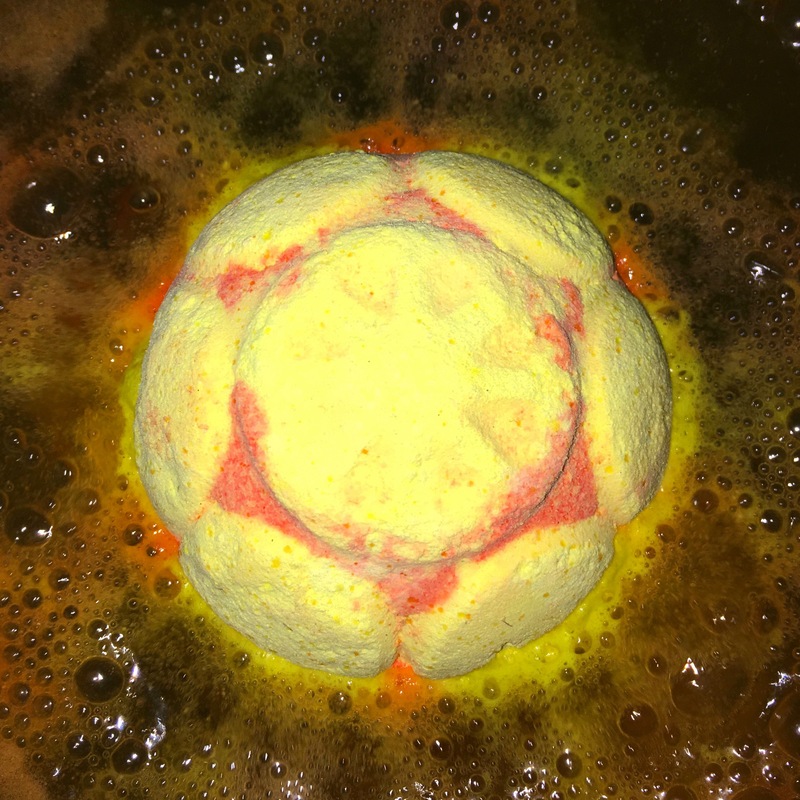 Including a long list of brightening, uplifting and awakening ingredients – Brazilian orange, grapefruit and orange flower absolute to name just a few, I was so sure that sharing a bath with the Marmalade jelly bomb was going to be an amazing experience. 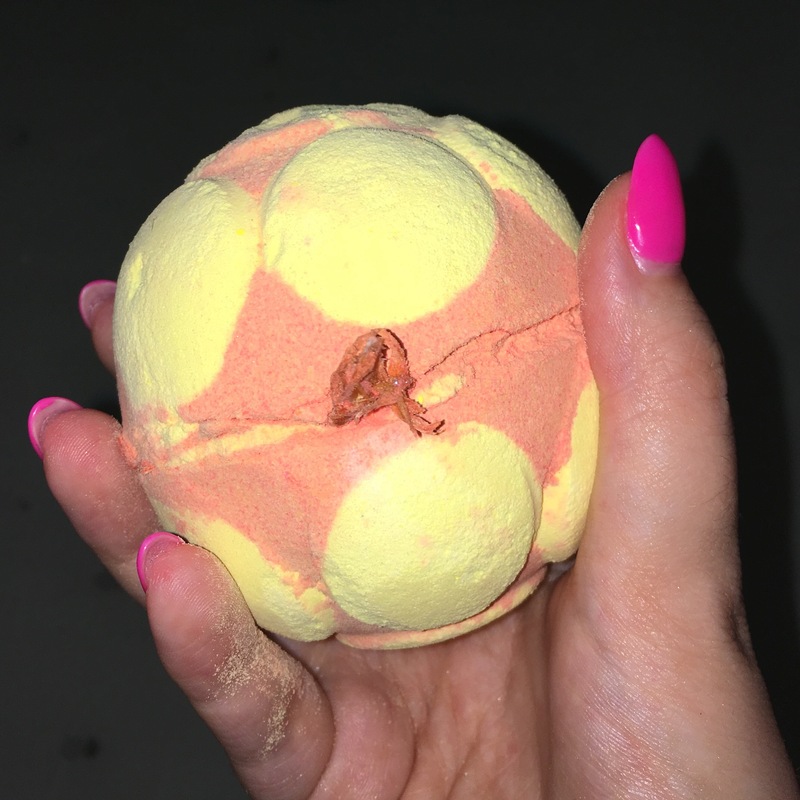 When my postman delivered my parcel containing the Marmalade jelly bomb I opened it up and was instantly greeted with a very bitter and sharp citrus scent, it wasn’t what I was expecting at all. The grapefruit in the Marmalade jelly bomb was completely different from what I had grown to love throughout the use of the Frozen bath bomb. The Marmalade jelly bomb’s scent is very intense, so much so that I was hoping that the scent dampened down somewhat once put into the bath water. Unlike the other 3 jelly bombs Marmalade has an extra hidden treat, inside is several chunks of orange slice reminiscent of the, The Sicilian bath bomb. As Marmalade comes into contact with your bath water it begins to ferociously hiss, sending a thin layer of small orange bubbles with a jelly like foam consistency across the waters surface. It was at this point that I realised the scent of Marmalade wasn’t going to dampen down, instead of the bath water diluting the jelly bombs scent it in fact strengthened it. It was at this point that I realised I’d finally come across a citrus based Lush product that I didn’t like. I called my husbands name, I have very unstable joints so need assistance when getting in and out of the bath, I didn’t want to stay in the bath or the bathroom for another second. With the jelly bombs I advise being in the bath when you use them, this is because as the jelly forms it can make the bath quite slippery. I find that the slippery surface does however disappear as the jelly slowly dissolves into water. I got out and because I hadn’t given the jelly a chance to dissolve the bath tub needed a good hose down. Even though I was only in the water with the Marmalade jelly bomb for a few minutes I did notice how soft and hydrated my legs felt once out. If you can stomach this jelly bombs scent then I’d definitely recommend it if you have dry skin, the effect the seaweed based sodium alginate ingredient within the new jelly bombs has on your skin is like nothing I have experienced while using Lush before. Each of the jelly bombs have left my skin in the perfect condition. Soft, hydrated and bright. I personally won’t be using the Marmalade jelly bomb again based just on its scent. Unfortunately it’s just not a scent I enjoy. I get a lot of comments on my Instagram account saying that I ‘big up’ all of the Lush products regardless of how I actually feel about them. This isn’t true at all, I always tell the truth and I guess this post is proof. It’s not often I dislike a Lush product but sadly when it comes down to the Marmalade jelly bomb I’m not keen. It does have good qualities too and I have mentioned them above, scent is however very important to me when it comes down to Lush products so on scent alone I won’t be buying this jelly bomb again. Anything with ‘sleep’ in its name always gets my attention. Apart from taking Lush baths my next favourite hobby is most definitely sleeping, I am however not very good at it so anything that could help me improve my ability to sleep is always very welcome. The Big Sleep Jelly Bomb is neck and neck favourite for me with the Dark Arts jelly bomb. I honestly didn’t think I would like any of the new jelly bombs at all but here I am ranting and raving about yet another. The Lush Jelly Bombs look just like an ordinary Lush bath bomb they however have a magic ingredient, sodium alginate. This ingredient is what divides the normal bath bombs to the jelly ones. Jelly bombs are meant to work in exactly the same way as the normal bath bombs, the difference between a jelly bomb and a bath bomb is, instead of just exploding with colour jelly bombs produce a foam-like-jelly that floats on the surface of the water instead. Containing lavender, tonka, neroli and chamomile the Big Sleep is the next best thing to a sleeping potion, there is no better combination of ingredients to help you wind down and relax. Although this is quite a powerful blend of essential oils Big Sleep’s scent isn’t at all overpowering, it’s a delicate and soothing mix. Its scent as a whole reminds me of several different Lush products such as the Unicorn Horn bubble bar, Twilight and Golden Slumbers bath bomb. Instantly after coming into contact with the water The Big Sleep begins to bob around, spreading blue foam across its surface. I noticed that unlike the Dark Arts jelly bomb, the Big Sleep took a lot longer to create its jelly layer. Once the layer of silky smooth jelly forms on the baths surface you start to really feel the benefits of it. My skin had never felt so well nourished before, the effect the seaweed based sodium alginate ingredient has on your skin is like nothing I have experienced while using Lush before. You heard it here first, the jelly bombs are going to change your life. Even the next day my skin feels soft, smooth and fabulous. Big Sleeps scent once in the bath doesn’t intensify at all making it a good product to use if you’re sensitive to some of Lush’s more powerful scents. After about 10 minutes the jelly dissolves into just bath water leaving you with a deep blue lagoon of silky smooth water. It’s hard to describe, I don’t want to mislead you by saying it ‘thickens the water’ as if someone said that to me I’d assume that the jelly and water had began to set. This isn’t the case at all. The dissolved jelly simply just adds a softness to the water and not in an oily way either, it’s so pleasant on the skin. Overall I am really impressed with this jelly bomb. The Big Sleep was in fact the first of the 4 jelly bombs that I reordered, what I thought was going to be a group of novelty products have really opened my eyes. If you want an easy way to add hydration to your skin while not getting oily then the jelly bombs are perfect for you.